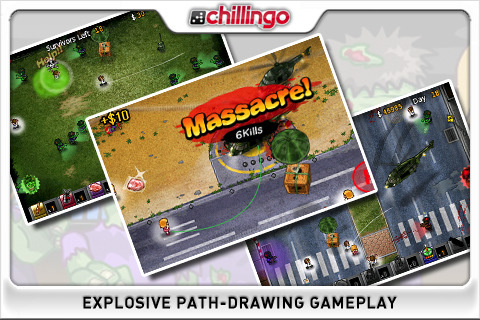 Zombie Escape….Well, you’re constantly escaping different zombie situations with a multitude of weapons and strategies. This may be called a line-drawer but it’s much more than that. You draw lines for the directions you want the humans to escape in, avoiding the zombies at all costs. 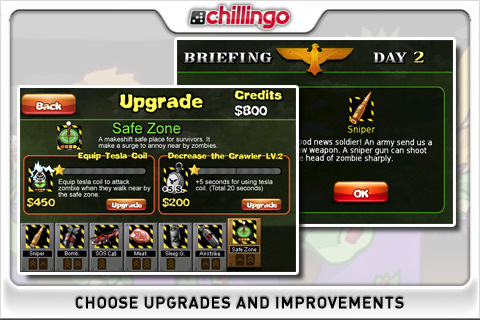 You have different weapons to attack and stop zombies with and much more. The goal is to get the humans out of the zombie-infected areas alive. Will you make it or will your brains just be another zombie’s lunch? The graphics in this game aren’t the best, but the game looks good anyway. The line-drawings could have looked a lot better and maybe more cartoonish, compared to everything else in the game. The lines look like they’re drawn by a cheap pen. The game does have some good graphics moments, such as the titles popping up when you do something and the entire color scheme. Other than that, the people and objects in the game can be too small to enjoy. Though the graphics might not be amazing, the cartoonish effects when you use an object against a zombie is fun to look at, making this one of those funny little games to play. If you’re expecting a major zombie game, then this probably isn’t for you as you don’t really see zombies. 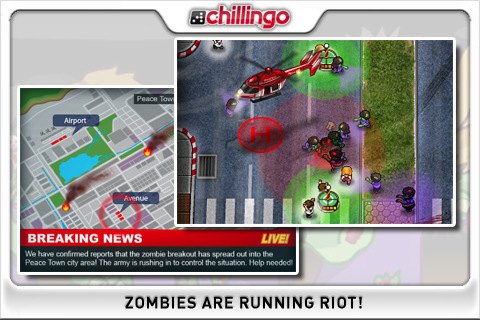 If the graphics were updated to see the zombies from a non-bird’s eye view then this game would probably be one of the greatest zombie games ever made for the iPhone and iPod Touch. The sound effects in this game are the high-point of Zombie Escape. It’s fun to here the humans being eaten by zombies and the whole scene is better with the soundtrack in the background. Helicopters sound great and everything else does, too. The sound distracts you from the not-so-great graphics. This is a fun game for those who like to escape situations. If zombie wasn’t in the title, it would just seem like a vampire-escaping game. Ok, maybe not, but it’s not a huge zombie game. The point of this game is to direct the humans to their means of escape, all while avoiding zombies who just want them for their brains. Simple game? No. This game gets difficult, and quickly. The controls are simple: Just draw a path for your human, to either escape or pick up a useful object on the way. Use these objects on zombies to escape quicker and easier. No matter how simple this sounds, it isn’t. This game can become intense with higher levels. To use an object, you first have to pick it up, by walking into it. Then, all you have to do is tap the object you want and then tap where you want to put it. That part’s simple, but the bar on the bottom that has all your objects is quite small, which makes it hard if you need an object really quickly. Sometimes you might not tap it just right and not end up choosing the object, which can be bad for intense situations. This is a fun game, but it can be improved by much. This game can use some major improvement, but it’s still a good game. If the line-drawing effect was improved to look more like the rest of the game and the zombies were more recognizable as zombies, this game woul be up there in the top zombie games. This is not the case, so until it’s updated if it ever is, this game is good, but not great. This game needs polishing. Chillingo usually releases top-grade quality apps, but they forgot some important aspects in this one. Hopefully, the score will be able to change with an update. For now, this game deserves a GOOD rating of 7.5 capsules. This score will improve when the game gets some well-needed polish.